The CW Network's Black Lightning, an electrifying new superhero, will make his debut on Tuesday, January 16 (9:00-10:00pm ET/PT), following a new episode of The Flash (8:00-9:00pm ET/PT). 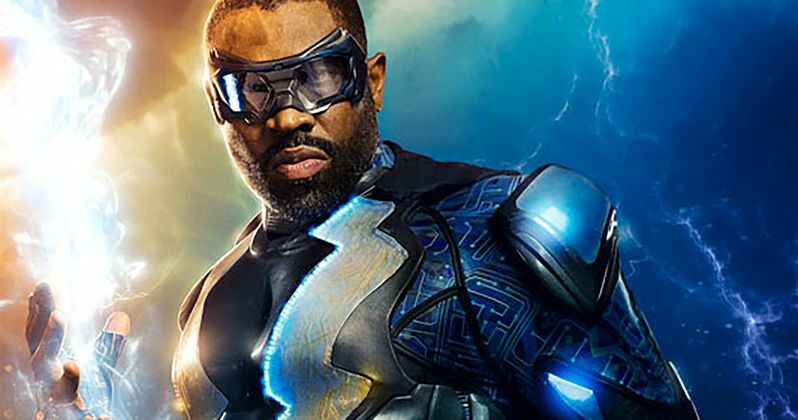 Black Lightning will be airing during the current time slot filled by DC's Legends of Tomorrow, which will return with new episodes on a new night and time in February. The series premiere date for Life Sentence, and the season premiere dates of The 100, The Originals and iZombie will be announced later. As Black Lightning begins, Jefferson Pierce (Cress Williams) is a man wrestling with a secret. As the father of two daughters and principal of a charter high school that also serves as a safe haven for young people in a neighborhood overrun by gang violence, he is a hero to his community. Nine years ago, Pierce was a hero of a different sort. Gifted with the superhuman power to harness and control electricity, he used those powers to keep his hometown streets safe as the masked vigilante Black Lightning. However, after too many nights with his life on the line, and seeing the effects of the damage and loss that his alter ego was inflicting on his family, he left his Super Hero days behind and settled into being a principal and a dad. Choosing to help his city without using his superpowers, he watched his daughters Anissa (Nafessa Williams) and Jennifer (China Anne McClain) grow into strong young women, even though his marriage to their mother, Lynn (Christine Adams), suffered. Almost a decade later, Pierce's crime-fighting days are long behind him... or so he thought. But with crime and corruption spreading like wildfire, and those he cares about in the crosshairs of the menacing local gang The One Hundred, Black Lightning returns, to save not only his family, but also the soul of his community. Based on the characters from DC, Black Lightning is from Berlanti Productions and Akil Productions in association with Warner Bros. Television, with executive producers Greg Berlanti (Arrow, DC's Legends of Tomorrow, The Flash, Supergirl), Salim Akil & Mara Brock Akil (Being Mary Jane, The Game, Girlfriends) and Sarah Schechter (Arrow, DC's Legends of Tomorrow, The Flash, Supergirl). The Black Lightning character was created by Tony Isabella with Trevor Von Eeden. The last update we got on the series was back in August, when it was confirmed that rapper Krondon has come aboard to portray Black Whale. As The CW's current series return from the holiday hiatus, Valor is back with original episodes on Monday, January 1 (9:00-10:00pm ET/PT). Crazy Ex-Girlfriend returns with new episodes on Friday, January 5 (8:00-9:00pm ET/PT). Supergirl is brand new starting Monday, January 15. Riverdale and Dynasty are back with original episodes Wednesday, January 17. Supernatural and Arrow will make their January premieres Thursday, January 18. Jane the Virgin comes back with new episodes Friday, January 26 (9:00-10:00pm ET/PT). In season finale news, Valor wraps its first season on Monday, January 29 (9:00-10:00pm ET/PT). The third season of Crazy Ex-Girlfriend concludes on Friday, February 16 (8:00-9:00pm ET/PT). Following is The CW midseason schedule of premieres and return dates, all times ET/PT.